Welcome to San Diego. Often known as “America’s Finest City,” this place has something to offer everyone. As the second largest city in California, and the eighth largest city in the United States, people from all over come to this ‘fine’ city. Whether it’s for business, or for leisure, you are bound to find an endless selection of fun activities. The Dream Team knows from personal experience (we completed our undergraduate studies in San Diego)… This place has it all and the weather is usually ideal- sunny and warm. One of the beauties of this city is that you can satisfy all your cravings: food, shopping, outdoor activities, meeting people, relaxing, gambling, and of course going out. The Mammys have compiled several ”recommended ” lists to help you plan your San Diego trip. One of the ‘big city’ perks is that you can always find a fun place to go to. But one of the ‘big city’ downfalls is … too many places, where does one go? The following places show you the diverse settings in SD. From sports bars, beach bars in Pacific Beach to the posh clubs in Downtown San Diego…. Get it here. *J Bar- (Downtown San Diego) – Hip, Trendy rooftop bar in the Gaslamp District. Great for group settings, grabbing a drink after work, hanging out with the girls. Perfect setting to debut your cute new top and jeans. *Tower 23- (Pacific Beach) – Not your average beach bar. If you want a prime location to watch the sunset – this is the place. Great outdoor patio. A posh spot in one of the ”casual” areas of San Diego. More of a lounge so if you want have your dancing shoes on …. Skip over to Johnny Vs down the street. *Stingaree- (Downtown San Diego) – Now this is what San Diegans call a ”club” – Vegas Style. The hip spot has 2 levels of dancing, and a rooftop level of chill music… ALWAYS PACKED. If you want to meet the San Diegans who ”live in the fast lane” you will meet them here. Lots of downtown locals… and DJ AM’s San Diego home. This is where you want to go ”all out”- new dress and all. *Air Conditioned- (North Park) – Discover your creative side at this ARTSY bar/ lounge in North Park. Lounge on the side with the artists, musicians of San Diego or hop onto the dance floor. If you like to experiment with fashion – or push the envelope – Air Conditioned is the place to check out. *Envy @ Ivy – (Downtown San Diego)- The hottest spot in San Diego. Envy has stepped it up- giving some of the big clubs a run for their money. Envy at the Ivy hotel is a lounge, bar, rooftop bar, club all rolled into one. The line usually starts forming before doors have opened. If you want to be ”seen” in San Diego, or if you want to see the ”it ” people of San Diego, you are bound to run into them here. Get your lip gloss on, your girlfriends ready to go (early), and put on those dancing shoes- because Envy is a place you won’t want to miss out on. *Yogis- (Cardiff by the Sea)- The ultimate beach bar. Newly remodeled and ready for business. This is the place to meet and mingle with the beach loving, surfer with goals. It’s a great way to end your week without having to get all dolled up. A great chill spot to watch the sunset, and grab a drink. Think of it as a beach / sports bar with a fun loving crowd. *KEEP IN MIND*- This isn’t Las Vegas- Most of the clubs/ bars have last call by 1245 am … They stop letting people in around 12am…. So make sure you plan accordingly! Take advantage of the location …. Check out the BEACH. If you aren’t a beach person, or if you are in SD when the laying out isn’t an option check out the following. *Torrey Pines Trails- Take a hike…. and go see the true beauty of San Diego. 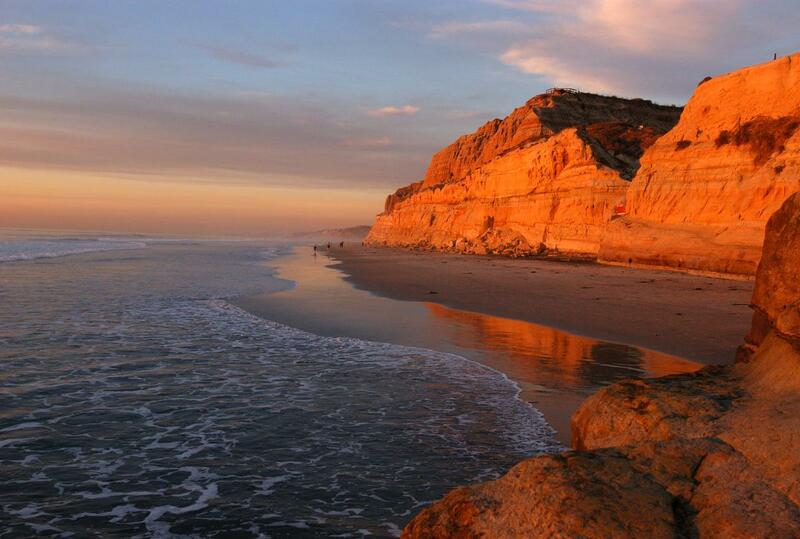 Located on the top of a cliff, next to the world renowned Torrey Pines Golf Course, this State Park has much to offer. Whether you walk the paths or venture down to the coast, the views are absolutely breath taking. So take a minute and when you feel like clearing your head, or just getting a little exercise, say ‘Hi’ to mother nature and visit the treasure just north of La Jolla. *Cowles Mountain- Want a bird’s eye view of the whole county of San Diego? Do what the locals do…. and hike Cowles mountain at the Mission Trails Regional Park. With various paths to choose from – you will never be bored. Once you hit the peak you’ll discover a whole new San Diego. On clear days you can even see Coronado. Challenge it solo, take a friend or a significant other (perhaps with a bottle of wine and blanket)… It’s a great alternative to hanging out at the beach. *Balboa Park- If you have the slightest interest in history, art, museums, nature…. check it out. It’s great just to walk around the gardens, checking out the local art shows etc. Or, if you want to see an art exhibit – check in to one of the museums. Step away from everyday life and take a minute to learn and appreciate all that’s around you. *Mission Bay/ Crown Point- Enjoy the beach, get a jet ski, rent some bikes and ride down the beach, or just go to relax. The options are endless at Mission Bay/ Crown Point. During the summer months you can watch the fireworks at Sea World. Bonfires are also allowed so after a day at the beach, cuddle up in front of a bonfire. *Keep in mind* – There are various hiking trails in San Diego. The above are just some of our favorites. For those of us who are addicted to coffee, or for those of us who just need a place to get some work done (with wireless internet access)- here is the list. Look around and you’ll see that San Diego has more than enough Starbucks to satisfy your internet and coffee cravings. However, if you are in the mood for something ”homey” or something a little less hectic, take a trip to one of the following. *Living Room- (Various Locations throughout San Diego)- Imagine a cozy, comfy living room. With mis-matched chairs and tables, this place is where you can do work, or relax. Grab a large cup of coffee, and maybe even a treat and take a seat. Most people there are to get work done or to study. It’s a great cozy atmosphere. *Java Depot-(Solana Beach) – Getting work done by the beach- How ideal. Java Depot is located on Pacific Coast Highway, and offers free wireless internet. They have great sandwiches as well as coffee. The great part about this place is that after you are done working, you are only a few footsteps away from the beach. *Cafe 976-(Pacific Beach)- A large porch wraps around this coffee house in Pacific Beach. With a wide variety of coffee to choose from you can spend a whole day here. Usually packed with college students, but a great place to stop in and send out a few emails. *Brickyard Coffee and Tea-(Downtown San Diego) – Located close to the Marina District, this cute coffee house has food and drinks for those relaxing mornings. If you are in the fast paced area of Downtown San Diego, stop on in and take a break. *Keep in mind*- San Diego Whole Foods Markets and Panera Restaurants offer free wireless internet for everyone too. There you have it … the guide to getting around San Diego and getting what you want out of this Fine City. Want to know anything else? Ask and you will get it!